This is wound-initiated discoloration in t he wood of box elder. The red color is frequently found in the core of box elders and is due to the response of the trees to injury. This response includes the rapid oxidation and depletion of energy (in the form of starch and more-or-less simple sugars), the oxidation of existing phenolic compounds and (perhaps) the new formation of phenols, and death of the symplast. 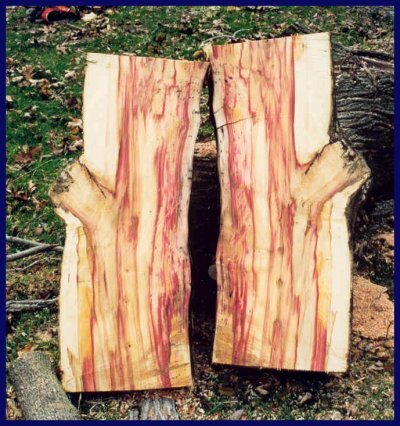 The discoloration process itself is initiated by loss of hydraulic integrity (the columns of water under tension in the xylem vessels snap) and drying. The discoloration process, as we understand it now, can occur without infection. In pathology lingo, it is a nonspecific response to abiotic injury. These changes can increase the resistance of the discolored wood to the wood decay process. The discolored wood frequently does (always?) become infected over time. Unfortunately, the infected and uninfected discolored wood can appear as identical. Over time, microorganisms (usually "pioneer fungi" and bacteria) tend to degrade the protective substances produced by the tree during the discoloration process, and the resistance to decay decreases. As the various fungi move through the discolored wood, some will actually "bleach" the wood and greatly lighten its color immediately before or during the breakdown of the wood substance itself. The role of the fungi is largely as decomposers that will decay the wood within compartment boundaries. Some fungi may be active pathogens and push against the boundaries and exploit breaks in the column boundaries. Source © Conversation with Dr. Kevin Smith Plant Physiologist Northeastern Forest Experiment Station, US Forest Service in Durham.